The fat marbling in kobe beef is so extensive, it seems to equal the amount of beef itself. Photo courtesy TheWagyu.com. Click a letter to get to the appropriate glossary page. Strips of meat are slowly cooked over wood chips, which smokes and preserves the meat. Jerky has been made since ancient times for exactly that reason: It traveled well, and the prepared meat kept for a long time. Well-made jerky is rich and smoky. The word "jerky" itself comes from the Quechua (Inca) word charqui, dried meat. While some people think of jerky as dry and chewy, gourmet products are moist and delicious. You can read reviews of some of our favorite gourmet jerky. 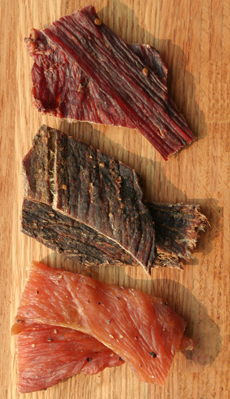 Pecan-smoked beef, applewood-smoked beef and turkey jerky. Photo by Michael Steele | THE NIBBLE. Read the review. 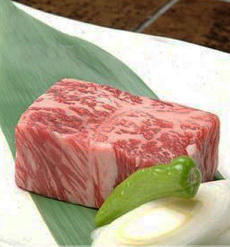 Kobe is a brand name of Wagyu, named after the Kobe prefecture in Japan, where it is raised. A very high grade of beef from black-haired Wagyu cattle, during the 2nd century C.E., Wagyu, was already a legendary breed when it was brought from its home on the Asian mainland to Japan. The breed was refined in the Kobe region of Japan over two thousand years and has become famous for its intense flavor and extreme tenderness. In Japan, Wagyu cattle are often crossed with other breeds (for example, some American Wagyu brands are a cross of Wagyu and the American Black Angus). 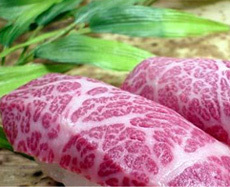 Sirloin slices, showing the extensive fat marbling that defines kobe beef. Photo courtesy TheWagyu.com. In the beginning, the marketing led people to belief that these cattle were pampered, massaged and brushed with saké and fed beer-and-saké mash. That may have been true with the original small herd, but large production makes that kind of treatment unfeasible. Still, this is quality stock, treated well, and it produces very tender yet full-flavored beef. Because of import restrictions, branded Kobe is not currently available in the U.S., due to testing issues for BSE* required by the USDA and the ability to consume most of what is produced at home. However, other Wagyu beef is now being imported to America, inspected as BSE-free before it leaves Japan and again by the USDA. Also, U.S. ranchers are applying the same breeding practices and producing a domestic Wagyu. For a comparison of prices, at Lobel’s Prime Meats in New York City, a 16-ounce boneless American Wagyu steak sells for $68.98, a prime dry-aged boneless New York strip steak is $46.98 (as of April 2007). *BSE, bovine spongiform encephalopathy, commonly known as mad-cow disease. Cuts of beef from the loin are among the most tender and the most expensive, but not necessarily the most flavorful. The tenderloin is the most tender of all steaks. It is a boneless cut that comes from the long muscle that runs along both sides of the backbone. It lies beneath the strip loin (strip steak). It can be purchased as a whole or partial tenderloin, but is usually cut into small medallions or filet mignons. Since filet mignons contain very little fat or marbling, they are usually wrapped in bacon or cooked with some form of fat to add flavor. Chateaubriand is a large section cut from the thickest part of the tenderloin. It is meant to serve two people. The T-bone is a steak with a T-shaped bone: on one side is an oval tenderloin, on the other side is a top loin, or strip steak. Some call it the “king of steaks” because it is two steaks in one, the best of both of the cuts in one steak: the tenderness of the tenderloin and the flavor of the strip steak. The porterhouse is a larger T-bone, containing more of the tenderloin and the sirloin strip. London broil is a cooking method, not a cut of meat. 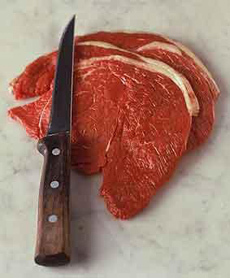 London broil is made from tough cuts such as flank steak. It needs to be well-seasoned and cooked to medium rare; then sliced very thin against the grain. Marbling is the intramuscular fat, the flecks of fat within the lean. The amount of marbling relates to quality grading: Greater amounts of marbling result in a higher quality grade. Marbling enhances palatability by increasing juiciness and flavor. 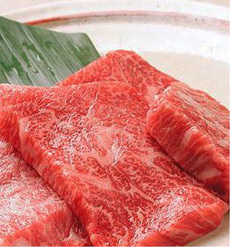 Beef from Wagyu cattle, the generic breed of Kobe, has the highest degree of marbling. Photo courtesy TheWagyu.com. Required by federal law to provide assurance of wholesomeness of meat to be sold. Meat inspection assures that meat is wholesome, has been handled in a sanitary manner and is properly labeled. Inspection of meat products is conducted by the USDA/FSIS as a public service, and is paid from tax funds. Cuts from the rib and loin section of the beef animal. A thin cut of steak that can be cooked “in a minute,” although five minutes might be more accurate. It is a popular cut with people who have the desire for, but not the time to cook, a thick steak. It is also very quick to thaw. A minute steak can be cut from the round, the sirloin, or any boneless cut of beef. To ensure tenderness, the meat is run through a tenderizing machine by the butcher or pounding with a kitchen mallet (it is called a cube steak because of the cube-shaped score marks that are produced by the tenderizing machine or the mallet). It is also an excellent cut for steak sandwiches. 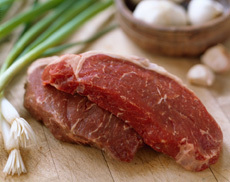 For top-of-the-line minute steak, ask your butcher to cut slices from the shell roast, the cut used for strip steaks. A delicious minute steak from WomackFarms.com. Moist-heat cooking uses liquid to cook the meat in a covered pot in the oven, on the range or in a slow-cooker. It is used for tougher cuts such as chuck, round, tip, fore shank, plate and flank. With natural beef, the animals are allowed to grow naturally, i.e., without growth hormones. They are fed quality diets, generally a vegetarian corn-based diet for 300+ days. This natural feeding process takes an additional 45 days for the animals to reach market, which is why natural beef is both more expensive and higher quality. While there are many fine natural ranchers, there is no industry regulation of the term “natural.” Thus, any company can call its product natural, and, unlike with organic products, there is no inspector to verify whether it is or not. See also organic beef. Also known as the Philadelphia cut, the New York system of cutting beef is the major system used in the U.S. The other is the Boston cut. 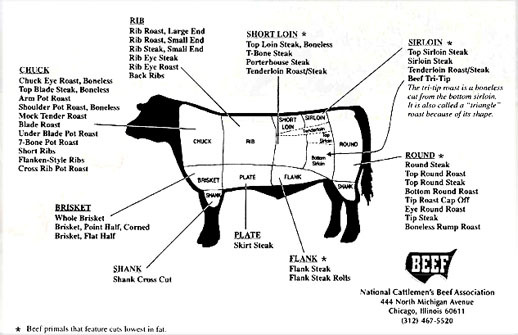 The first point of difference is when a side of beef is cut across at right angles to the backbone, into the hind quarters and the fore quarters. In the New York system, all ribs are left on the fore quarter; in the Boston system, three ribs are left on the hind quarter. Thus, the first cut of the fore quarter in the New York system (a prime rib roast) is the same piece of meat as the first cut on the hind quarter in Boston. There are many other points of confusion. The U.S. Department of Agriculture uses the New York system; the Boston system is used only in New England. The strip steak is a firm-textured, well-marbled cut, tender, juicy and and flavorful, that is a favorite among steak-eaters (it’s the second most popular cut). It comes from the most tender section of beef, the short loin—it is the boneless top loin muscle, a porterhouse minus the tenderloin and the bone. However, some people leave the bone in on a strip steak, believing that it optimizes the flavor. New York Strip Steaks from Rocky Mountain Gourmet Steaks. The strip steak is also known as the strip loin, Delmonico, boneless loin, boneless club steak, or sirloin strip (which is confusing because it’s not really part of the sirloin). Ideally, the steak should be cut 1-1/2 to 2 inches thick. Connoisseurs say that keeping the bone in optimizes the flavor.